Where will Corruption take India? The most disquieting aspect of the widespread corruption in India is the fact that it is not anymore confined to politicians or the government machinery alone. It is prevalent amongst almost every section of the society at every level. As the practice of corruption is a dishonest act, one has to think that most of the Indians are dishonest, which could be different only in degree between the individuals. As the reason for the dishonesty is greediness and the desire to get things done at any cost one can think that most of the country men are greedy and do not anymore think that the means should justify the ends. It does not shock Indians anymore to know that not only the politicians, ministers and IAS & IPS officers are corrupt but even the judges, professors, doctors and NGO organizations are. This is not a flattering statement and many readers would desire that it would not be so and such statement could have been avoided. But, the fact is that most of the Indians are involved in corrupt practices in one way or the other, either due to greed or due to so called compulsions. In any case, the willingness to sacrifice for the sake of not getting involved in corrupt dealings is conspicuous by its absence amongst the most. Today, if one would say that any particular Indian is honest to the core, it could only be a case of exception rather than a rule. as one of the most corrupt countries in the world. Unfortunately, this view has not disturbed most of the Indians at all and they do not seem to care as to what others think of them; so long as the existing systems and practices would allow them to make money and get things done in one way or the other. The irony is that India is still considered to be a very religious country and it is still widely believed that the religion is the basis of Indian life, thoughts and actions. This is obviously true, considering the fact that there are hundreds of temples, churches and mosques spread all over the country and they are all densely visited day in and day out by the feverishly praying Indians. Is not religious ethos contrary to corruption and dishonest practices? The unfortunate situation in India is that those who call themselves most religious are often found to have indulged themselves in dishonest practices on many occasions. Several of the religious centres, of all religions, are suspected to be steeped in nepotism; as such incidents have been repeatedly published in the press. It does not shock Indians anymore to know that not only the politicians, ministers and IAS & IPS officers are corrupt but even the judges, professors, doctors and NGO organizations are. Corruption is not only prevalent amongst rich who are greedy in spite of possessing enough but also prevalent amongst poor. Now, what can be the future of the Indian society in such conditions? It can be only frustration, chaos, unrest and even bloodshed in the not too distant future. This kind of corruption in the national polity and public and private life cannot go on for ever, without disturbing the overall peace in the society. It is sad that those who are in charge of the nation today do not appear to realize this and still are merrily going ahead with their dealings unconcerned about the harm that it would inevitably do to the larger national cause. What is very sad and extremely disquieting about this country is that Ministers suspected to be involved in murder. Chief Ministers of swindling crores of public money, senior police officers of molestation charges are all living in comforts and enjoying positions, thus effectively exposing the fact that the crusade against corruption has finally failed in India. Even as the vicious cycle of corruption would continue with one swindling the other, there could be a number of persons who would be left out of this cycle due to inefficiency or commitment to the cause of truth and such persons would be driven down to despair. 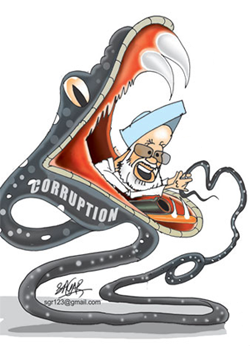 The incidents of history indicate that some of such persons who are out of the corruption loop could take up the war against corruption at one time or the other. But, they would find that in a corruption entrenched system, they would not be able to improve the conditions and therefore, a few of them may finally take to physical attack on corrupt and dishonest persons, leading to violence and bloodshed. Security, dogs and mere police rifles will not be able to beat down such determined crusaders. The politicians and bureaucrats would call such crusaders as arsonists or terrorists. But, history would judge them differently. There are a number of determined isolated war groups already existing in the country and they are generally branded as terrorist groups and treated brutally by the state machinery, without investigating the reasons for their existence. One would shudder to think as what would happen to the peace of the society, if such groups would enlarge in size and number. we can find diamond. We will an alternate to UPA..People are not going to vote for the corrupt government that is what the present government has been. As you sow, so shall you reap. UPA will certainly get fruits of its deeds. streets to turn the table. Right people will come forward and march together. - government for the people. A nice article raising several pertinent questions regarding corruption. But only the ouster of UPA cannot ensure the cleansing the Augean stable. People in their daily life should practice honesty . Dishonesty is now the best policy in every sphere of life. Getting by hook or by crook is now the rule of the day. Suppose you go to the railway counter and do not get the desired ticket. Then immediately what plays in your mind is to get the ticket by unfair means. This is the root of all corruption. If people really dont want corruption, no government can stay in power.